Three months later, I’d like to apologize to the poor citizens of Ottawa for taunting Mother Nature – I completely underestimated her wrath. Now some of you may be thinking “hey, we’ve had snow, too”. No, you haven’t. Toronto? 190 cm. Waterloo? 246 cm. Montreal? 346 cm. Vancouver? Please. After the 56 cm we received this past weekend, we’re at 410 cm, or almost 14 feet of snow. When I say I’ve never seen this much snow, it’s true – the record was set during the winter of 1970-71, just slightly before my time. We still have another foot to go to set the record, and I’m hoping it happens. Second place is for chumps, and I didn’t strain my back shoveling for the past few months just to finish behind some lame measurement from the Nixon era. I’ve embraced the new Ottawa landscape. Our backyard, untouched for the past two months, has become an awesome playground, with trenches, tunnels, and forts of stunning size. As I played with the boys after dinner tonight, I was also struck by a sudden sadness. This wonderland is fleeting, and I don’t have long to enjoy it with Aidan and Kieran before it disappears, perhaps never to return. So, Mother Nature, now that you’ve dumped all this on us, would it be too much to ask to let it stay around for a while? I’ve got a few more forts to build, a few more holes to dig, a few more muscles to pull from shoveling. 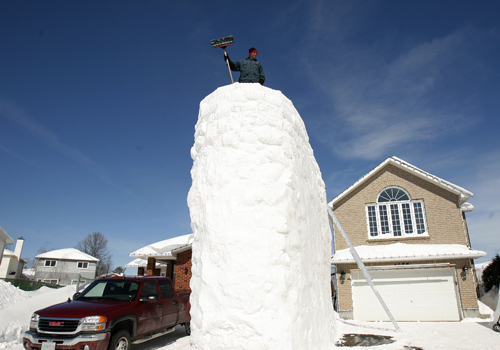 FYI, our snowbank isn’t quite this high. Luc Guertin from Orleans built this 16 foot monster by hand over the past couple of months. I don’t know what you’re talking about Chris. We had at least 3 (3!) days of snow this winter. And on another note, did you see my pictures of the flowers blooming out here?